Email click here to email Split Duct. Bridge Crossings; Temporary and Emergency Repairs; Industrial Plant Services; Pole Risers; Enclose and Protect Other Line Services; Utility Entrances; Surface and Underground; Telephone Duct Repair; Anywhere cabling needs would require future access; and anywhere mechanical protection is needed. Split-Duct spacers available for extra capacity. TO VIEW THE ENTIRE SPLIT-DUCT CATALOGUE CLICK HERE! ANYWHERE MECHANICAL PROTECTION IS NEEDED. Distributor and Rep. areas open -- Call write or E- Mail for more information. 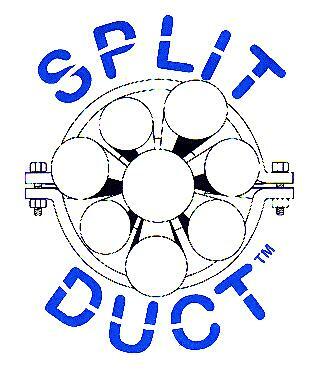 E-mail: click here to email Split Duct. Return to Dennis Filges Home Page.